MSRM US302 WiFi Range Extender Review - Get back Your Investment? A low-frequency wireless network is painful for every wifi user. Nowadays; without wireless internet, anyone can`t access their smart life and wifi network most essential for home, office, and workstation. If you think need a strong network for your home and workplace with high frequency, here the MSRM US302 wifi range extender is the right solution for you. The MSRM US302 WiFi range extender review will provide you a bunch of positive and negative information that will help you to decide the extender back you worth of investing money or not? The various online marketplace has lots of wifi range extender but why I am talking about Debbiecty MSRM US302? Because I get lots of positive information about the range extender from online with deference kind of verified buyer. The maximum buyer provides five-star upvote for the MSRM US302 WiFi Range Extender. Here I recommend the key feature, pros, and cons. I hope you already start thinking about the key feature but you do not understand properly. Here I am going to explain you most important feature below. I know you have a wireless router in your home or workplace and you have low-frequency problem. That’s why you are here about wifi range extender review. The MSRM wifi extender helps you to convert the endless network to boost high-frequency network signal and that will cover your full house or workplace. Simply connect the range extender to your selected wireless network enjoy high-speed internet with you’re all of the wifi enabled devices like iPad, iPhone, Tab, Smart TV, YouTube and internet browsing. Do you know what is WLAN and LAN? I think you know about Wireless Local Area Network (WLAN) and Local Area Network (LAN). Here the dual band wifi extender MSRM US302 include WLAN and LAN port for catching user instances. You may have confused what you can do with the port? For better understanding about it here I provide you a real example; You have set your router on the ground floor and try to get the wifi network in your 5th floor. Just buy RJ-45 or ethernet cable and plug into your router single LAN port and the 2nd end of ethernet cable plugged into your MSRM US032 range extender WLAN port. Now your router provides LAN internet and your wifi extender gets the network via WLAN port and extend the same network with WIFI. Note: the logic 100% working and I already use my wifi range extender within this process. You can use less than 120ft ethernet cable for the experiment. Most of the electronic devices have the WPS or reset button. Here the MSRM US032 wifi range extend include WPS button for user good experience. You can reset the range extender when it will work slower than before and reset the SSID Password etc. The MSRM US302 WiFi Range Extender has to include dual relation external antennas for receive and provides high-speed wireless frequency for other wifi enabled devices. What you think right now about the MSRM US032 range extender? 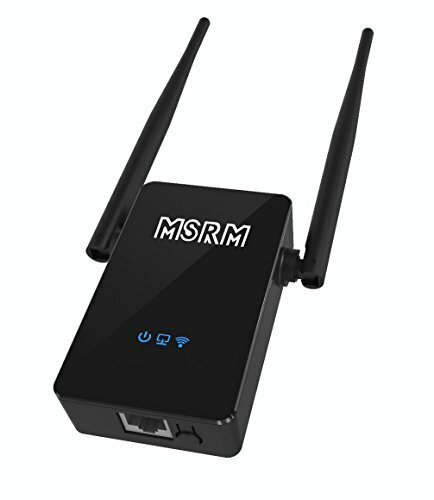 If you think the wifi range extend definitely back worth of your investing money and it will work properly for your endless wireless network do not hesitate to make an order for MSRM US032 range extender.